Batch water heaters are simpler than any other water heating system, including active, thermosiphon systems, or conventional water heaters. However, they provide less hot water, usually only 15% to 40% of a family's yearly demand. 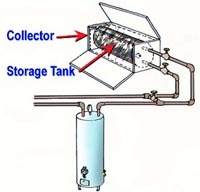 Batch water heaters combine the collector and storage tank in one box. The box has insulated sides, a glazing cover and one or more tanks inside. If the box has an insulating lid that can be "closed" at night or during bad weather, the unit is called a "breadbox" water heater. On a sunny day, sunlight travels through the glazing and strikes the tanks, which are painted black or covered with a heat-absorbing material. As the tanks absorb the sun's energy, the water inside heats up. This "preheated" water goes directly into a conventional water heater. Many batch heaters are manufactured and sold commercially. However, because of the simplicity of their design, some people build their own. Most of the materials can be purchased at local hardware stores for between $300 and $600 (depending on the design). 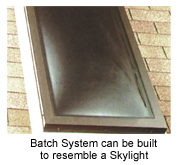 The appearance of batch systems has been a major drawback, but units are now available that fit into the roof structure and resemble a skylight. Others can be enclosed within interior spaces, so they are less obtrusive and are protected from freezing.